Past Mario games have let the blue-suspendered hero roam around fully rendered 3D landscapes. Now, for the first time, players can see true depth of their environment without the need for special glasses. 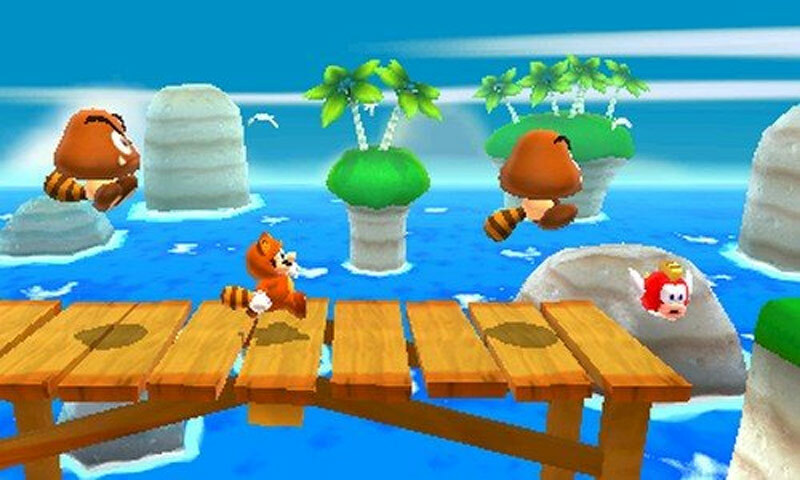 Super Mario is a 3D evolution of classic Mario platforming featuring new level designs and challenges. I don't know that I'd go quite that far--the slow start burns up a lot of levels with areas that aren't particularly challenging or effective as tutorial sequences to prepare you for the rest of the game. But if you've already made the investment in a 3DS and you're looking for something--anything--that resembles a must-own game, Super Mario 3D Land is precisely that. It homes in, with a clockmaker’s precision and a playful gleam in its eye, on what Mario does best. Super Mario 3D Land isn’t perfect, but the few complaints I have (like the lack of variety in boss fights and some re-hashed levels) can’t bring down this entertaining mix of nostalgia and innovation. ? Conflicted throughout, but still an undeniable 3DS achievement. Wait for it to get its act together and the game soars. Well, flutters. Overall, Super Mario 3D Land alone is one of the best reasons to buy a 3DS. 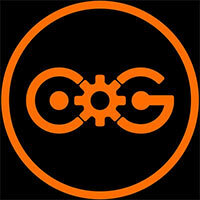 The gameplay is fun, creative, friendly, but also challenging at times. At this point, it is THE 3DS game that everyone was hoping for and it did not fail expectations. In fact, it is so good that it really makes me look forward to what other first-party games Nintendo will offer in the future but I don’t see how they can top this one at this time. 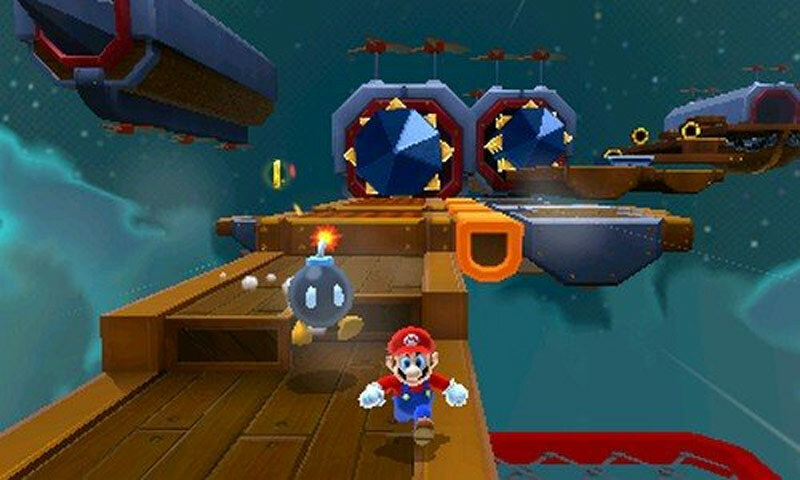 Super Mario 3D Land represents the first 3DS title to fully make use of the system's capabilities. With an expertly balanced difficulty progression, dazzling level design and masterful Power-Ups, this is the ideal 3DS experience. It's obvious that Nintendo played it fairly safe for Mario's first 3DS outing — something that will likely make the game seem like a bit of a step backwards from the brilliance of the Super Mario Galaxy series — but it's impossible not to be impressed by the vast number of classic Super Mario elements that have been squeezed into the package, especially given how fresh they all look and feel in their new 3D presentation. The gyrometer is used at binocular stations in certain stages. These stations let you search out hidden toads that shriek with delight and throw star coins or other power-ups at you. 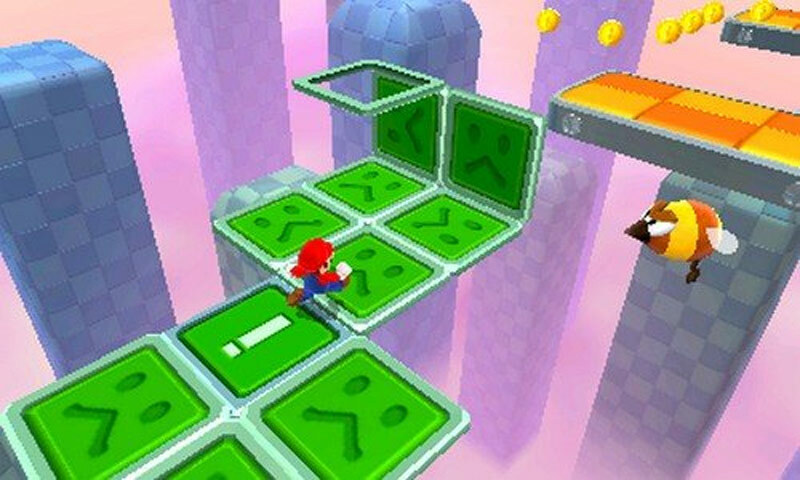 Despite the fact these features lack the imagination seen in the game’s level design, Super Mario 3D Land is still a delight. With well-realized stages and responsive controls, it's an easy recommendation for all action-loving 3DS owners. Despite a few odd quirks, Super Mario 3D Land is a great 3DS game that goes back to its roots in being a solid platformer that's a blast to play, even if there's the occasional bout of dying a dozen times due to a misjudgment of leaping distance. 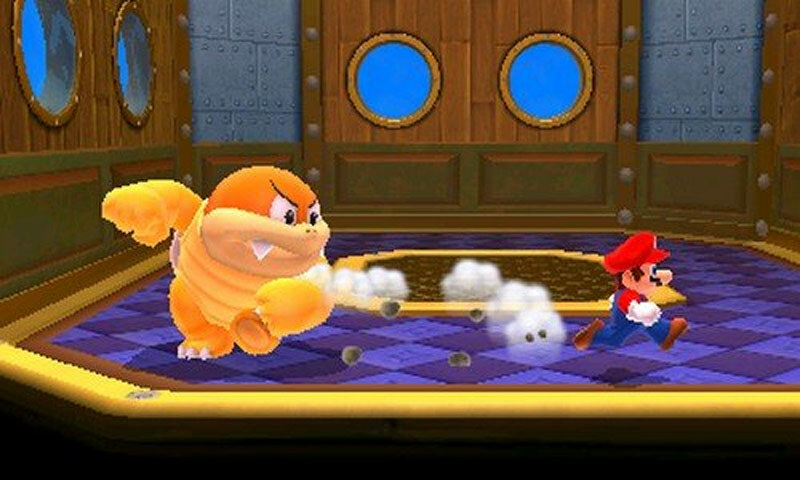 While it would've been nice to see Mario and company in a new story other than the standard "rescue Princess Peach" plot we've seen before, the extras and secret stages more than enough make up for it. Again, compared to the depth of Galaxy that sounds lacking, but the quickness to the levels makes 3D Land more addictive, as you’ll feel like completing just one more stage before closing your 3DS and returning your attention to whatever is happening in real life. Unlike the running mechanic, this change in styles with the level design didn’t leave us wanting. Nevertheless, Super Mario 3D Land is a great little game that pretty much every 3DS owner should invest in. While it's nowhere near as intricately challenging as the old scrollers from which it draws inspiration. and it lacks the ambitious scale of Super Mario Galaxy, it is still packed with innovative gameplay and that unmistakable Mario charm. It's also easily the most beautiful game on the 3DS, and one of the best-looking Mario games. The powerups are impressively squishy-looking. I also admired the metallic texture of big spiked pistons as they killed me, and the surprisingly scary animations of Bowser as he killed me. It is, then, a step back and a leap forward. 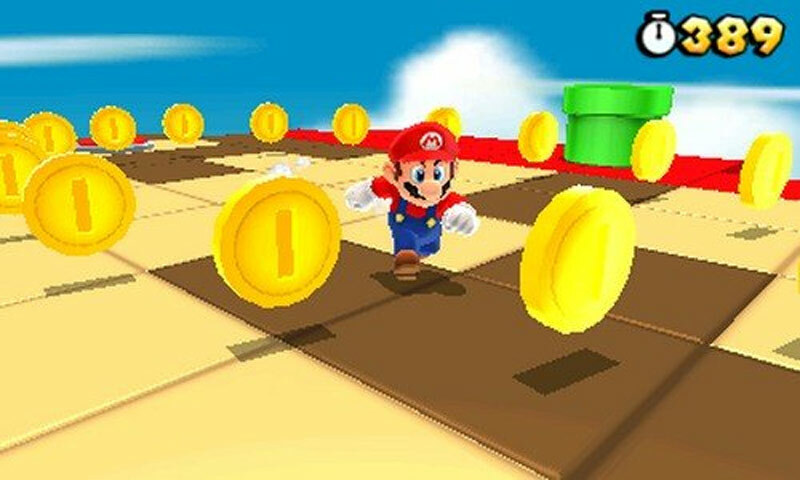 As a gateway drug for those reluctant to embrace Mario in three dimensions, Super Mario 3D Land should be a huge success. And if Nintendo does manage to convince that audience, that's something for us all to be excited about. After all, next time, he won't have to wait around for anyone to catch up. Super Mario 3D Land is a welcome addition to the portable's library, sure to satiate your platforming appetite, but I just can't shake the thought that had it been given a little more time in the cooker, a "Must Buy" score would have been readily handed to it. You could wish for 3D Land to be a little more challenging in places, then, but you couldn't wish for it to be any denser, any more imaginative, or any more daring. Most importantly, you couldn't wish for it to be any more playful. Mario does it again in a fantastic platformer suitable for both novices and experts. Does any of this sound like it’s worth forty dollars? I certainly think so. 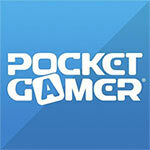 If you’ve been waiting for a really good game for your 3DS, by all means go get it. If you haven’t bought a 3DS, I say go and buy one along with this game too. It is unsurprising that the best game to come out on the system yet is, of course, a Nintendo property, but man, if it’s not an excellently well made product. You owe it to yourself to play it. By combining the slick 3D polish of modern-era console Mario with the pure and simple challenge of the classic platform era, Nintendo have created a true gem. The frustration one encounters falling off a slick edge for the 14th time is outweighed by the addictiveness of achievement. It’s linear, to the point and perfectly tuned for a portable experience. El mejor lanzamiento de Nintendo 3DS para finales de año y el primer videojuego que aprovecha realmente el efecto estereoscópico de la portátil. En definitiva, Super Mario 3D Land es un título indispensable de 3DS. Su ritmo permite tanto partidas largas como sesiones de juego cortas, cada nuevo nivel es una sorpresa y además se controla de forma tan maravillosa que acaba siendo totalmente adictivo. Super Mario 3D Land constitue une entrée en matière idéale pour tous ceux qui s'essaieront pour la première fois à un épisode du plombier. Ceux qui pesteraient contre sa trop grande facilité auront l'heureuse surprise de constater que Nintendo a tout de même pensé à eux dans la seconde partie du jeu, et que la durée de vie du soft n'est pas aussi maigre qu'elle pourrait le sembler à première vue. Entre 5 et 6 heures suffiront pour venir au bout de l’aventure, qui se poursuit cependant avec une seconde partie, plus retorse et pleine de surprises certes, mais loin d’être insurmontable. Super Mario 3D Land reste toutefois un jeu efficace possédant un côté addictif plus que séduisant. Ca sera suffisant pour sortir la CB, croyez-nous. Les fans exigeants devront eux attendre la seconde partie de l'aventure et les niveaux spéciaux pour retrouver un jeu de plates-formes enfin digne de son rang. On aurait aimé qu'il en soit ainsi dès le départ. Un nuovo "perfect score" non è in discussione per via dei difetti descritti poco fa e i voti interi di Eurogamer negano a Super Mario 3D Land quel 9.5, che sarebbe il suo voto. Immaginate quindi questo numero qui sotto, con una bella lode a fianco... e ora correte ad acquistare la vostra copia, ma fate attenzione ai funghi lungo la via! Het vermakelijke en zoals vanouds bekende rondspringen, voorwerpen verzamelen en het gebruik van 3D zorgt voor een creatieve mengeling tussen de oude en nieuwe Mario. Weliswaar een minder lenige Mario dan we gewend zijn, maar dat heeft ergens wel zijn charme. I slutändan är 3D Land, trots sina fjuttiga skavanker, ett fullvärdigt komplement till serien som verkligen visar vad konsolen går för. Super Mario Galaxy 2 är fortfarande bäst, men med knapp marginal den här gången. Äger du en 3DS finns det ingen tvekan om saken. Lev på nudlar om du så måste. Super Mario 3D Land är konsolens obligatoriska spel.